Los Angeles, Calif. (Oct. 25, 2013)— On Sunday, November 10, an all-star lineup will take the stage to perform at the T.J. Martell Foundation’s 5th Annual Family Day LA including Award-winning pop duo Karmin, international recording artist and American Idol finalist Jessica Sanchez, new rising pop star Megan Nicole and Universal’s girl group Cimorelli. Laura Marano, singer/songwriter, UNICEF Ambassador, and star of Disney's Austin & Ally will host the family day affair alongside Disney star and Hollywood Records recording artist Coco Jones, in an effort to raise funds for leukemia, cancer and AIDS research. Family Day kicks off at 12p.m. and runs until 4p.m. on the CBS Studio Center Back Lot in Studio City. Sponsored by Tone Body Wash and Citibank, the event will honor three leading lights in the music industry: Bruce Eskowitz, COO of Red Light Management, Phil Guerini, the Vice President of Programming and General Manager of Radio Disney and Michael L. Klausman, the President of CBS Studio Center and SVP of West Coast Operations and Engineering. Amy Renee Heidemann and Nick Noonan are the lovable, genre-bending pop duo, Karmin, the first fan-discovered group to translate from "viral sensation" to "stadium status." With over half a billion views and double platinum sales since their launch into the mainstream, they've blitzed the world with their perpetual touring schedule and debut TV performance on SNL leading into major appearances across radio, print, TV and film. “We are so excited to be a part of Family Day and show our support for the T.J. Martell Foundation,” says Karmin, the Epic Records’ duo. 18-year-old vocal powerhouse, Jessica Sanchez, captivated America on season 11 of American Idol. She has since performed concerts around the world, performed for President Obama and President Clinton and was a recurring guest start on Glee. On Family Day, Sanchez will perform some new music including her hit single "Tonight" featuring Ne-Yo from her debut album, Me, You & The Music, which debuted at No. 8 on the Pop charts. 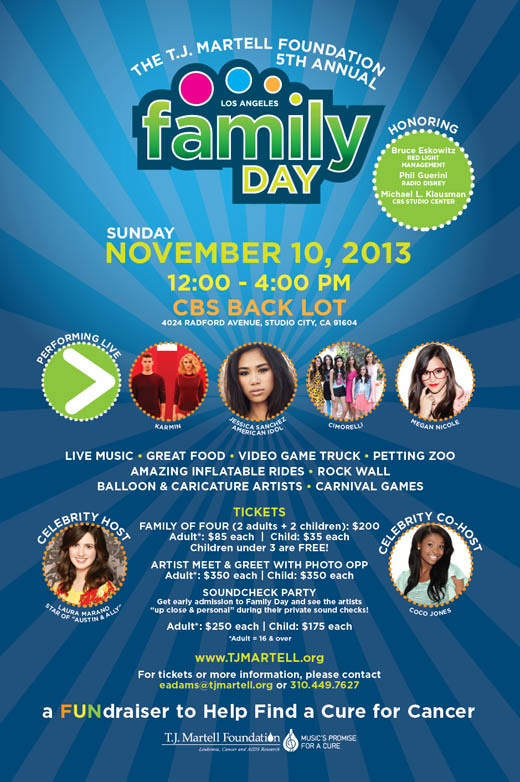 Also performing at Family Day is another YouTube success, 20-year-old recording artist Megan Nicole. "I'm so excited to be performing at Family Day this year,” shares Megan Nicole. “I'm thankful to be able to support such an important cause as we continue to work together to find a cure." The rising pop vocalist launched to stardom when her creative covers and original songs went viral on YouTube. She now has over 400 million streams, over 30 million on her first two original songs, and is touring worldwide. Cimorelli is the latest emerging girl group from Universal’s Island record label. Comprised of six sisters, the girl group has over 2 million subscribers on YouTube with over 500 million views. Their fan base has grown to such a level that they recently won a Teen Choice Award for Web Star and when they released their “Made in America” EP in June it debuted on the Top 10 worldwide on the iTunes ® charts. Cimorelli spent the summer touring the U.S., culminating with a performance on Good Morning America. Last month, the T.J. Martell Foundation drew over 1,500 supporters and raised over $700,000 from its 14th Annual Family Day Event in New York City. Music favorites such as Jason Mraz, Ed Sheeran, Austin Mahone, Emblem3 and Greyson Chance entertained the crowd while Disney breakout star Bridgit Mendler from the hit series “Good Luck Charlie” rounded out the line-up as the event’s guest host. Family Day is one of the music industry’s signature events providing a spectacular day full of fun games, carnival activities and food to raise money for leukemia, cancer and AIDS research. Having steadily grown into one of the Martell Foundation’s most successful events, Family Day has raised close to $5 million for Martell-funded research at twelve hospitals across the country. Last year’s sold out event in LA featured performances by Cody Simpson and many others. For additional information on the T.J. Martell Foundation’s 5th Annual Family Day, please go to www.tjmartell.org or call 310.449.7627.